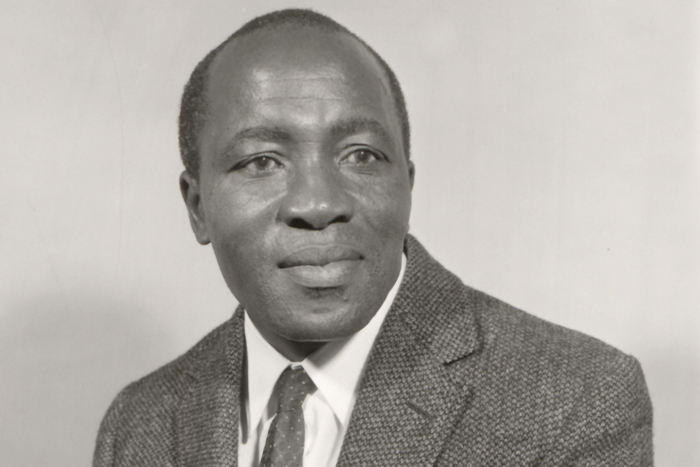 Archibald Campbell Mzolisa Jordan, the son of an Anglican minister, was born on 30 October 1906 at the Mbokothwana Mission Station in the Tsolo District of Pondoland in Transkei (now Eastern Cape). He completed his primary education at Mbokothwana Mission, St Cuthberts Primary School. After receiving the Andrew Smith bursary he went to Lovedale College in Alice, where he passed his Junior Certificate (Standard Eight or Grade Ten). In 1923, Jordan went to study at St John’s College in uMtata, Eastern Cape. He won a scholarship to Fort Hare University College, Eastern Cape, where he obtained a teacher’s diploma in 1932 and a BA degree in 1934. That marked a new start of an exceptional academic, political and literary career. Jordan taught for 10 years at the Kroonstad High School, Orange Free State (now Free State) where he mastered seSotho and was elected President of the African Teachers' Association. During this period, he completed a thesis on the phonetic and grammatical structure of the Baca language and was awarded an MA degree by the University of South Africa in 1944. Some of his poetry was published in the Imvo Zabantsundu newspaper. In 1940, he started working on his only novel, Ingqumbo Yeminyana, a tragic epic about the conflict between Western-style education and traditional beliefs. This novel was to become a landmark in Xhosa literature. On 2 January 1940, Jordan married Priscilla Phyllis Ntantla. In 1945 Jordan began teaching in the Department of African Languages at the University of Fort Hare after the retirement of Davidson Don Tengo Jabavu. In 1956 Jordan became the first African to receive a doctorate for a phonological and grammatical study at the University of Cape Town (UCT). By 1957, Jordan was appointed as a lecturer in African Languages at the UCT. While at UCT, he developed a new method of teaching Xhosa to speakers of other languages and became an inspirational teacher of Xhosa culture and language, as his students were later to testify. Jordan’s term was very short at UCT. Like many others, he became involved in opposition to the government's racial policies. In 1961, he was awarded the Carnegie Travel Grant to tour universities and colleges in the United States of America (USA), but was refused a passport. Jordan opted to leave South Africa on an exit permit with his son Zweledinga Pallo Jordan, who would later become the Minister of Arts and Culture, post-1994. Jordan and his son reached London in October via Botswana and Tanzania. Early in 1962, Jordan settled in the USA, where he was made a professor in African Languages and Literature at the University of California’s Los Angeles campus, and later at the University of Wisconsin in Madison. There, after a long illness, he died 20 October 1968. Yet his voice continued to be heard long after his death. In 1972, his critical study of Xhosa literature was published, and in 1973, a collection of short stories in Xhosa was translated into English under the title, Tales from Southern Africa. His great novel Ingqumbo Yeminyana was published in English as The Wrath of the Ancestors (1980), in Afrikaans as Die Toorn van die Voorvaders (1990) and in Dutch as De Wraak van het Voorgeslacht (1999). Three of his books were published following his death: Kwezo Mpindo zeTsitsa (1970), Tales from Southern Africa, (1973), and Towards an African Literature: The emergence of literary form in Xhosa (1973). In 2004, 36 years after his death, the University of Port Elizabeth conferred a doctorate in literature on Archibald Campbell Mzolisa Jordan. He was honouredfor exceptional contributions in literatureby the South African government and awarded the Order of Ikhamanga in Goldin September 2005.